Morning everybody! So the Super Bowl LII was yesterday and the Eagles won, congrats! But my main focus was the Halftime show! 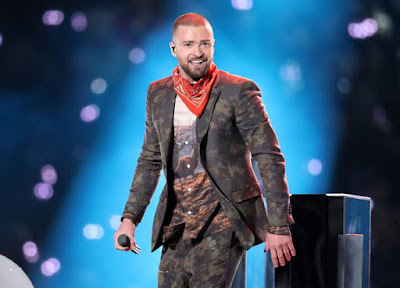 14 years after nipplegate Justin Timberlake took centre stage as the Halftime Show act on this year's Super Bowl at U.S. Bank Stadium in Minneapolis.He performed his hit singles SexyBack, My Love, Rock Your Body, Cry Me A River, Suit & Tie, Mirrors, Can't Stop The Feeling, along with his new single Filthy. Timberlake also performed his ballad Until the End of Time which he mashed-up with Prince's I Would Die 4 U, making a heartfelt tribute to the late icon. Watch it below!